Yoda was blue? Who did Lando con? 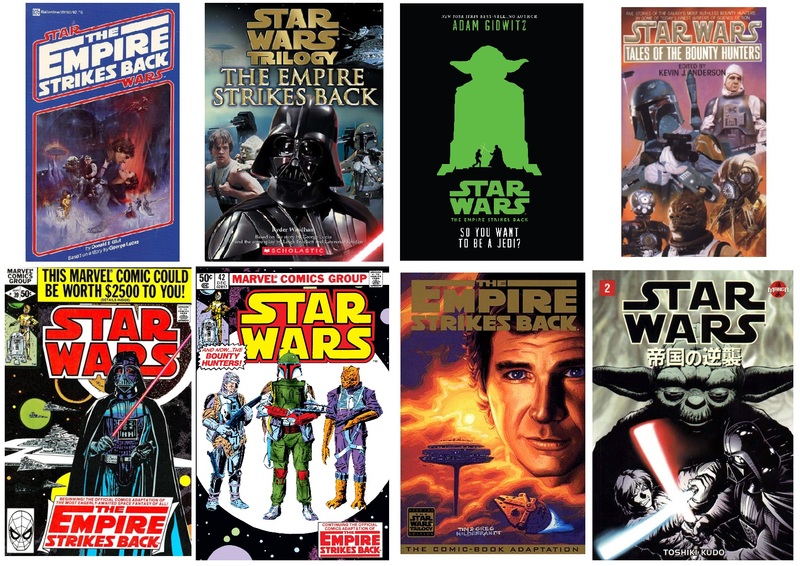 Discover all the variations between the original trilogy and its book and comic counterparts. Adaptations play a big part in Star Wars history. They didn’t just retell the stories of the films. They featured deleted scenes. Named background characters. Had new dialogue. This article series explores some of these novelizations and comic adaptations, and how they deepened Star Wars. 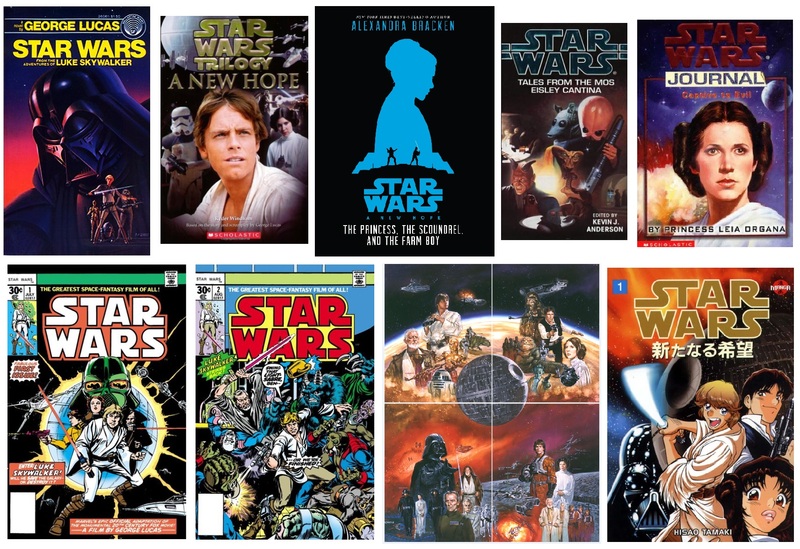 Covers of various A New Hope adaptations. Released six months before the movie arrived in cinemas, there are many interesting things to note from this novel. But the most is probably the opening prologue, which basically tells us the entire story of the prequel trilogy way before those movies were even made. In hindsight, this prologue is very accurate to those movies, showing that George Lucas always did have the general ideas in place. While this prologue is also the first, and for a long time the only, mention of the Whills within the Star Wars universe, they recently were mentioned again in the prologue of The Force Awakens novelization which was a clear homage, due to both being written by the same author. Selected differences from the comic adaptation. The original six-part adaption of the movie, as published by Marvel, was drawn while the movie was still in production and thus contains quite a fair share of oddities in the looks of ships and characters, some even getting alternate color schemes. But despite these changes, the story flows remarkably well and captures the movie quite faithfully. But it also includes deleted scenes. Recently, this comic was rereleased by Marvel with new coloring. For the Special Edition release in 1997, Dark Horse released a new adaption which included the changes made to the movie, like Jabba as a Hutt in the docking bay scene, rather than the Nimbanel as per the Marvel comic adaption. Also fun to see in hindsight is that Yularen appears on the cover for issue #3 of the Special Edition comic adaption, despite, at the time, being nothing more than a background extra, before his role got expanded hugely in The Clone Wars. 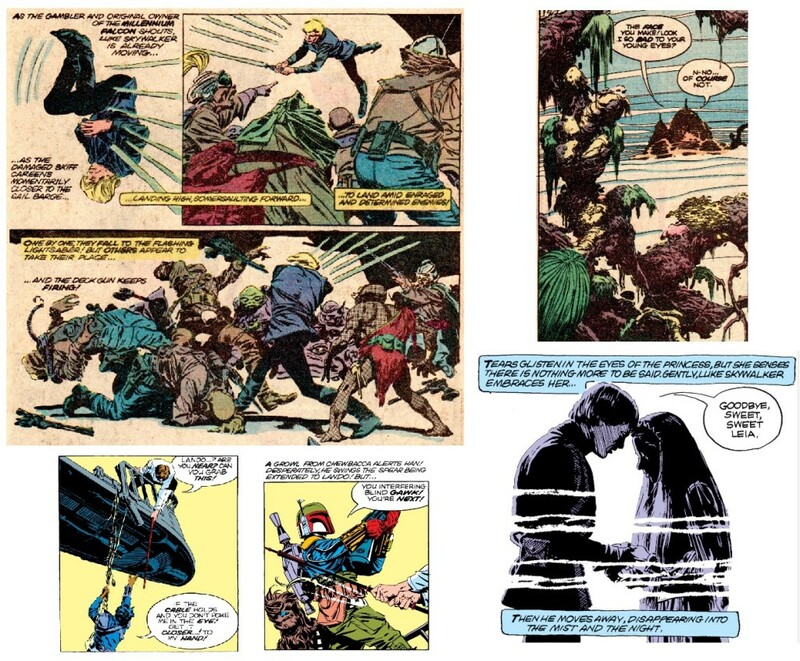 All four comics interlock to form one bigger image (seen above). 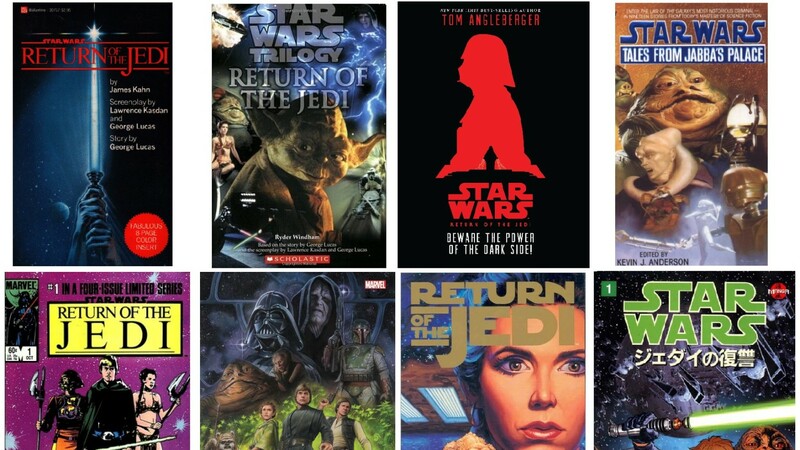 Other adaptations: A junior novelization by Ryder Windham, a manga comic by Hisao Tamaki, Star Wars Journal (Captive To Evil & The Fight for Justice), Tales of the Mos Eisley Cantina and last year’s A New Hope: The Princess, the Scoundrel, and the Farm Boy. Covers of various The Empire Strikes Back adaptations. Unlike the book adaptation of A New Hope, the novelization of The Empire Strikes Back does not add many new things to movie, and it seems that Glut really had to stick close to the script. 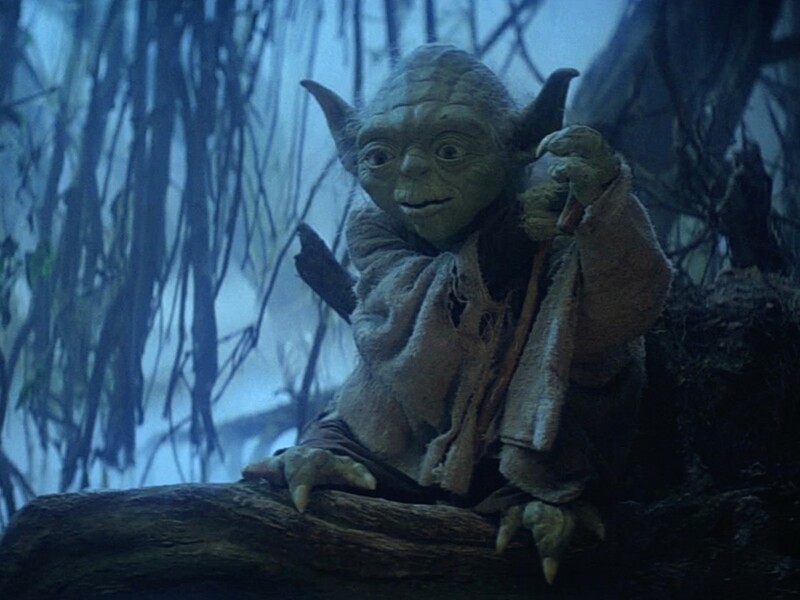 The biggest expansion on the movie is the much longer training that Luke receives on Dagobah. We read about the metal bar that Luke had to slice in mid-air twice (first failing, then succeeding) and the Seeker Droid balls. Also changed is when Luke gets his vision of Cloud City; in the novel it happens when Luke is meditating, and not while being upside-down trying to lift some rocks. And then there is the fact that Yoda was blue. Just like the adaptation for A New Hope, The Empire Strikes Back comic was released as part of the ongoing Star Wars Marvel series as issues 39-44. Archie Goodwin, Al Williamson, and Carlos Garzon were responsible for adapting the movie. While Goodwin was working on the Marvel ongoing Star Wars series already, Wiliamson and Garzon started on this title with this adaption. 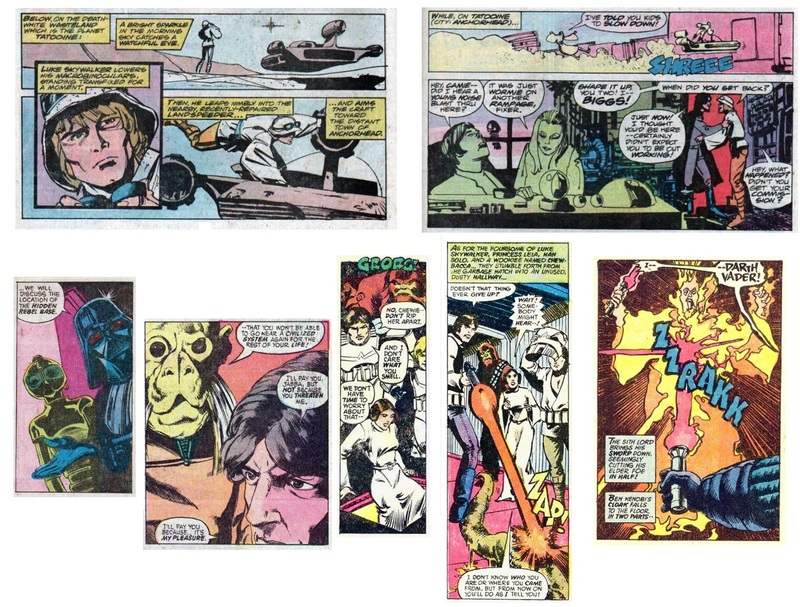 With the first issue having been released in June 1980, the comic at least did not spill the huge secret of Darth Vader and the appearance of Yoda (although he appeared in the first editions looking more like the old McQuarrie concept art, and he is also way too small in some panels). 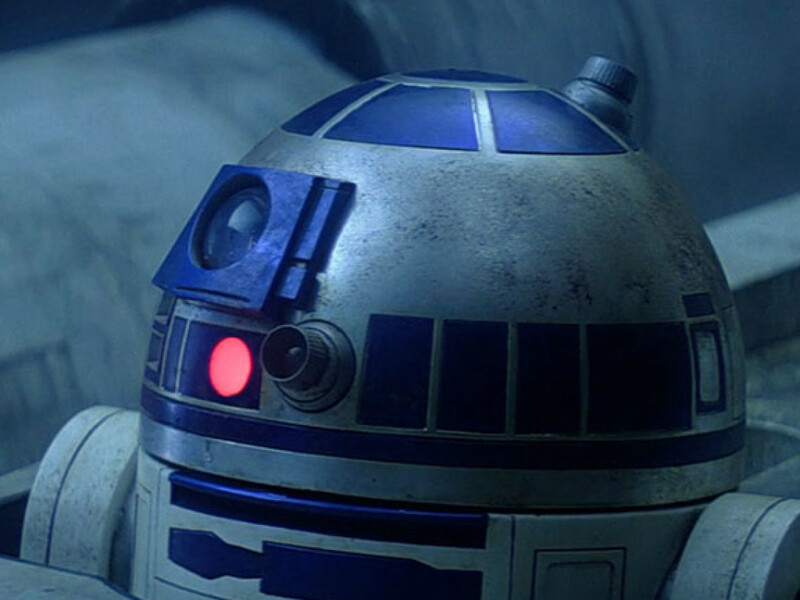 Another curious element is that while we see the beginning of the famous deleted scenes of the wampas in Echo Base, with Artoo and Threepio talking next to the door about the trapped creatures, everything else — like the ripping of the door sign and the snowtroopers getting mauled — does not happen in the adaptation at all. 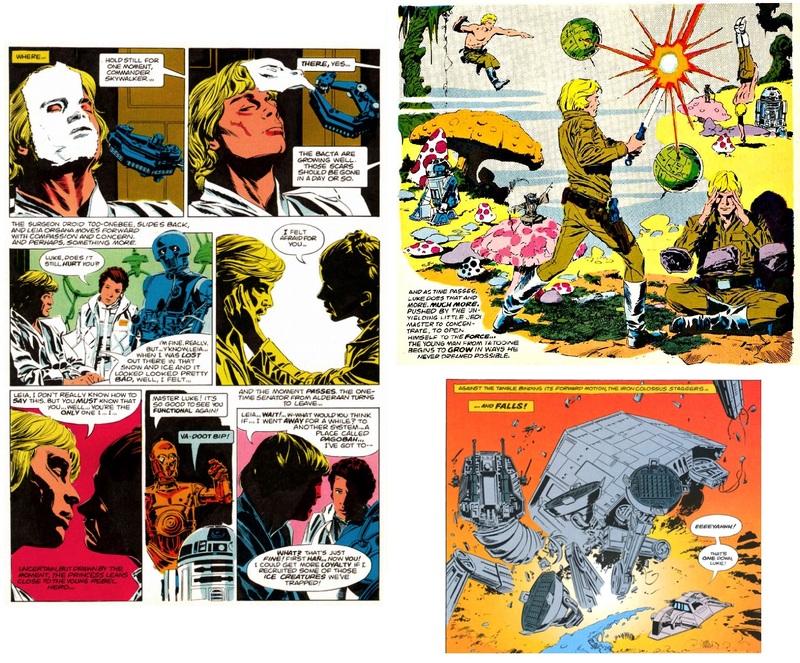 With the release of the Special Editions in 1997, this comic received a reprint rather than a new adaptation like A New Hope did. These Tales of novels are collections of short stories dealing closely with characters seen in the movies. This book ties in with The Empire Strikes Back and tells the reader stories about the bounty hunters searching for Han Solo, but also what happened to the last transport to escape Hoth. Other adaptations: A junior novelization by Ryder Windham, a manga comic by Toshiki Kudo, and The Empire Strikes Back: So You Want to Be a Jedi? 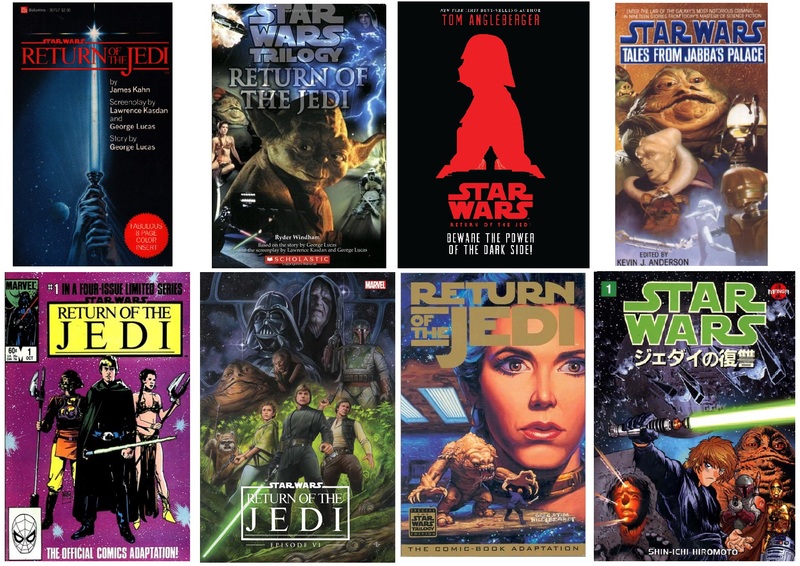 Covers of various Return of the Jedi adaptations. The last novelization is quite a typical one that includes all the known deleted scenes, adds quite a few interesting new stories (explanation of the battle of Taanab, another con of Lando’s on Pesmenben IV), and does not skip anything from the movie. The most peculiar thing about it is how it hits the mark very close with the prequels (the background of Palpatine and Mon Mothma), but also contains something that Attack of the Clones later overwrote: Owen Lars was originally the brother of Obi-Wan Kenobi, explaining why baby Luke was brought there. 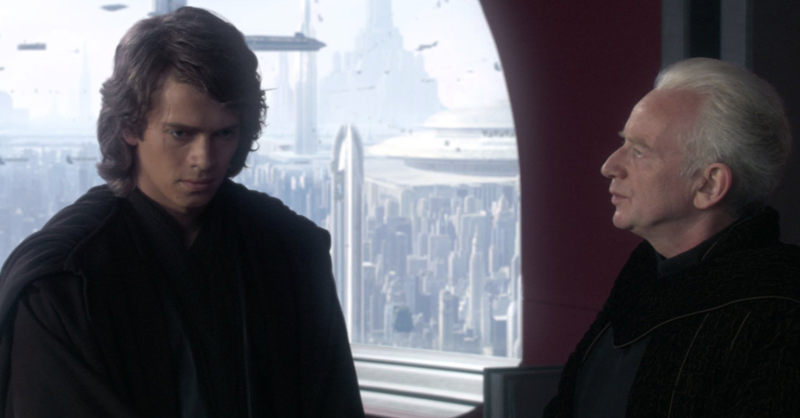 Also, as he dies, Anakin looks back on his life and remembers the molten lava pit, his wife (unnamed on purpose), and his friend, Obi-Wan Kenobi. So far so good and it makes sense — except Anakin wishes he had met Yoda, so he could thank him for training his son. Considering that he does quote the “luminous beings” line from Yoda, perhaps Anakin just wishes that he had seen Yoda once more? While the same team returned to finish the trilogy of comic adaptations, some things changed compared to previous comic adaptations. Return of the Jedi was published as a separate miniseries, taking place between issues 80 and 81 of the ongoing series, and in four issues rather than six. Again the series was released a couple months after the movie to avoid spoiling. With two fewer issues, you would expect the comic to not feature many new/deleted scenes — and maybe even skip scenes as seen in the movie. But that does not happen, and it even adds little bits of extra dialogue here and there. 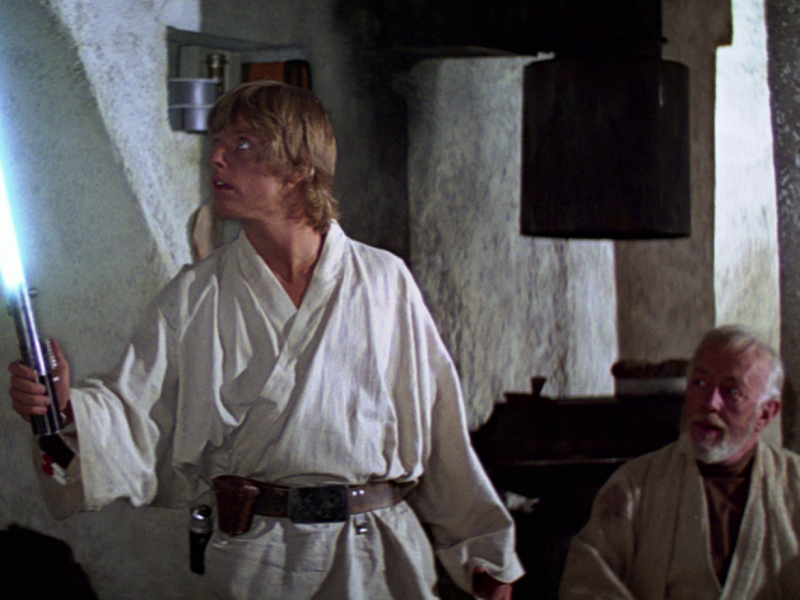 A glaring omission, however, is the death of Yoda, and the Jedi Master telling Luke that there was another Skywalker. Instead, it is said that Luke leaves Yoda to his much needed rest with the spirit of Obi-Wan filling Luke in about Leia. Also, it is Wicket who steals the speeder bike on Endor, and Jabba speaks about killing Jedi when it still meant something to be a Jedi. Other adaptations: A junior novelization by Ryder Windham, a manga comic by Shin-Ichi Hiromoto, Tales of Jabba’s Palace and Star Wars Journal: Hero for Hire. Covers of various adaptations spanning the entire saga. And then there are novels that cover the entire saga. 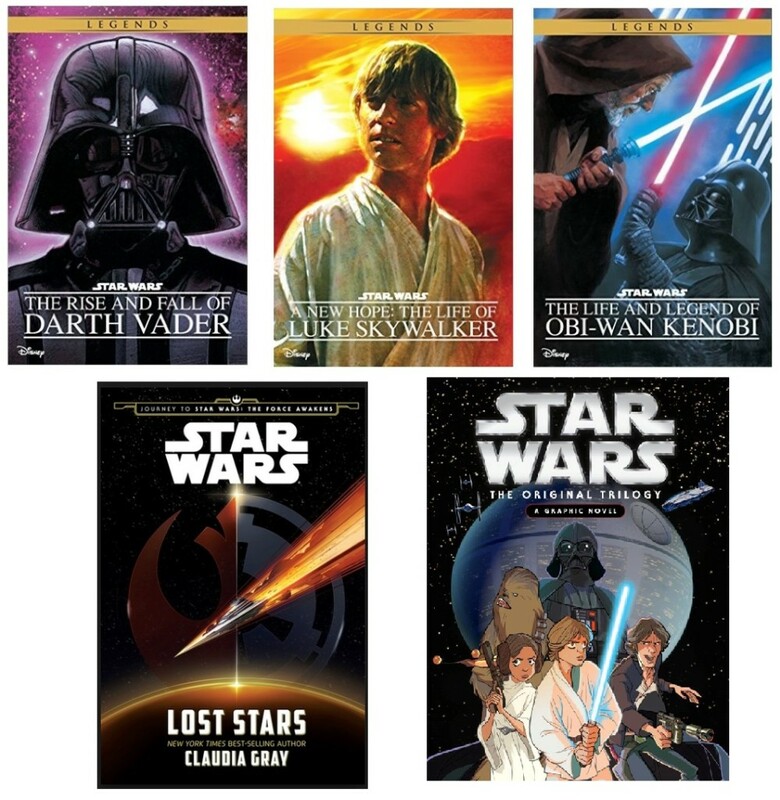 Besides the recently released Lost Stars, which covers a period from before A New Hope until post-Return of the Jedi, there is a novel series by Ryder Windham that covers the lives of the most important characters throughout the entire saga. These books are: The Rise and Fall of Darth Vader, The Life and Legend of Obi-Wan Kenobi and A New Hope: The Life of Luke Skywalker. 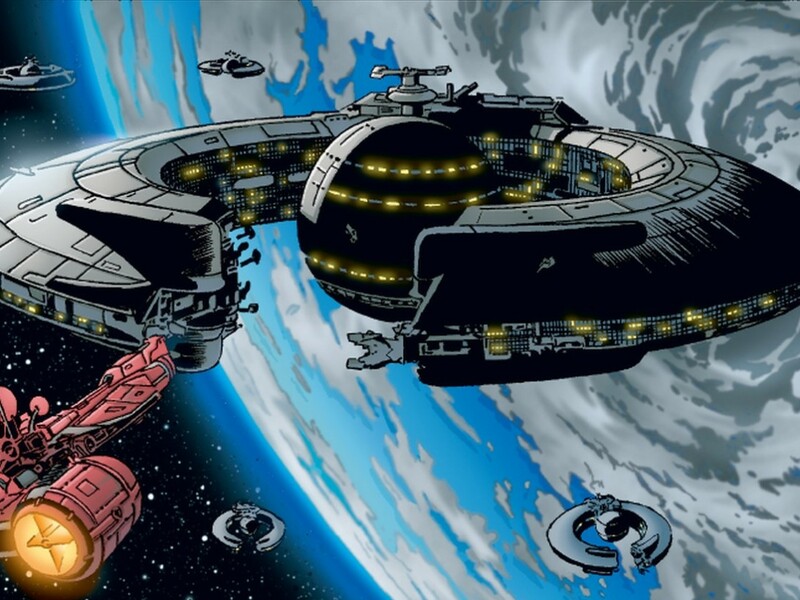 Also included in this series, yet limiting itself to The Phantom Menace, is The Wrath of Darth Maul. When it comes to comics, the upcoming Star Wars: The Original Trilogy — A Graphic Novel is an adaption of A New Hope, The Empire Strikes Back, and Return of the Jedi, and was previously released as a comic in foreign markets. 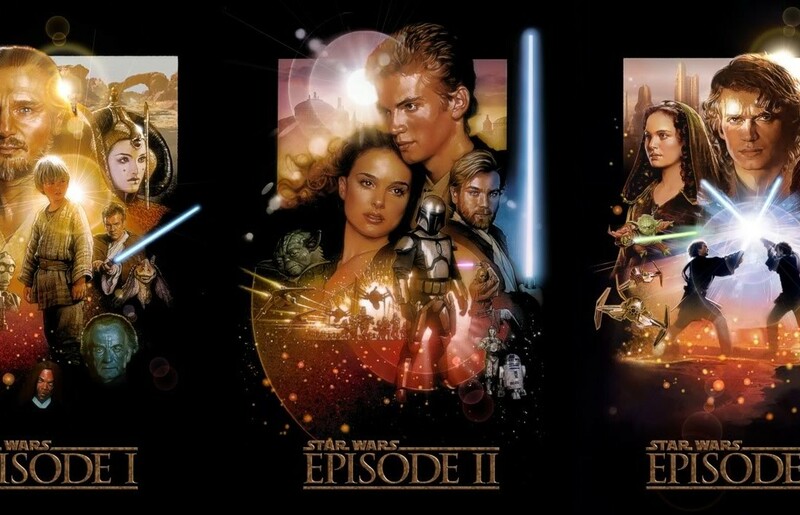 Join us next time for part two, in which we take a look at the various adaptations of the prequel trilogy! 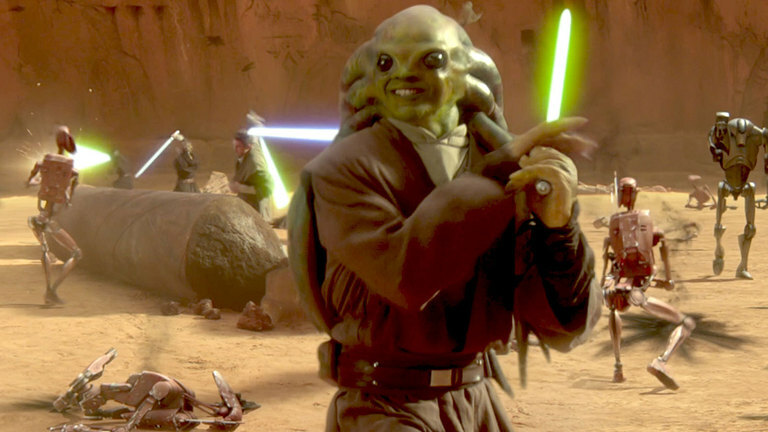 Sander de Lange (Exar Xan) worked on the Rogues Gallery feature in Star Wars Insider and has written the back-story of Niai Fieso through “What’s the Story?”. 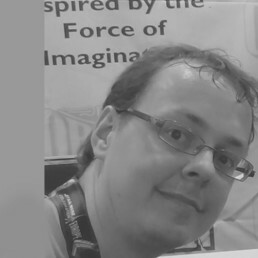 He is an editor for TeeKay-421, the Belgian Star Wars Fanclub and an administrator for the Star Wars Sourcebooks page on Facebook.